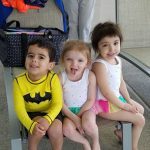 Our (almost) 2.5 year old son is about a month into his first class with North Jersey Aquatics and LOVES it! Even in this short time, he has become more comfortable in the water and is starting to understand the basics of pool safety. Compared to other swim programs, North Jersey Aquatics provides a more personal experience – which is exactly what we were looking for! His instructor is so patient and enthusiastic and she truly takes the time to connect with each child in the class making them feel comfortable in the water. She is definitely a huge part of why our son gets so excited for class each week. Additionally, she takes the time to explain things to the parents which has been equally important to us at this young age. We can’t wait to continue taking swim classes with North Jersey Aquatics!